Spring is in the air, I’m so excited! Winter is definitely my least favorite time of year, the days are short, cold and gray here in NJ. 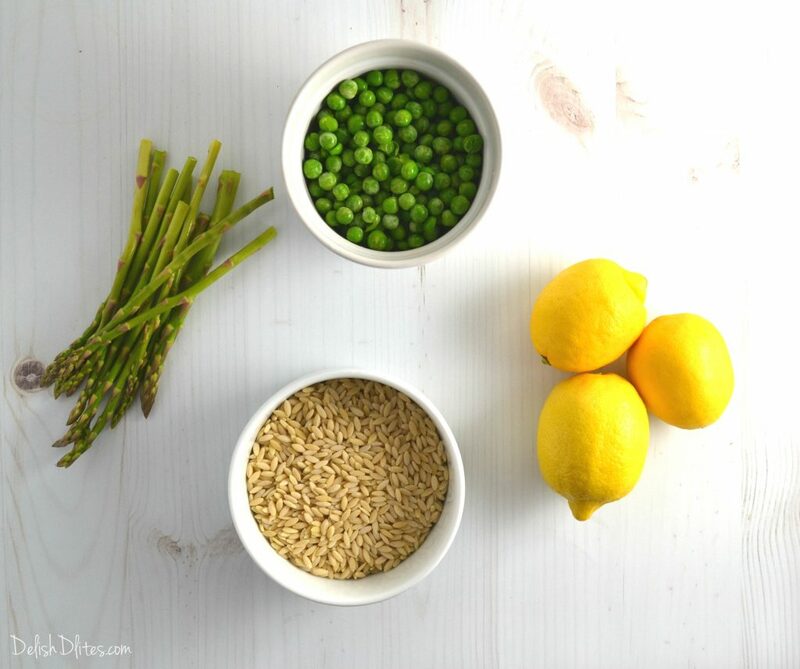 I’m ready for lots of sunshine, warm weather, and dinner parties where I can serve this Spring orzo salad! I feel like the unofficial start of Spring is Easter, at least for me it is. It’s the first major gathering my family hosts after Christmas and New Year festivities. Everyone’s been cooped up for months, so by the time Easter rolls around, everyone is in party mode. 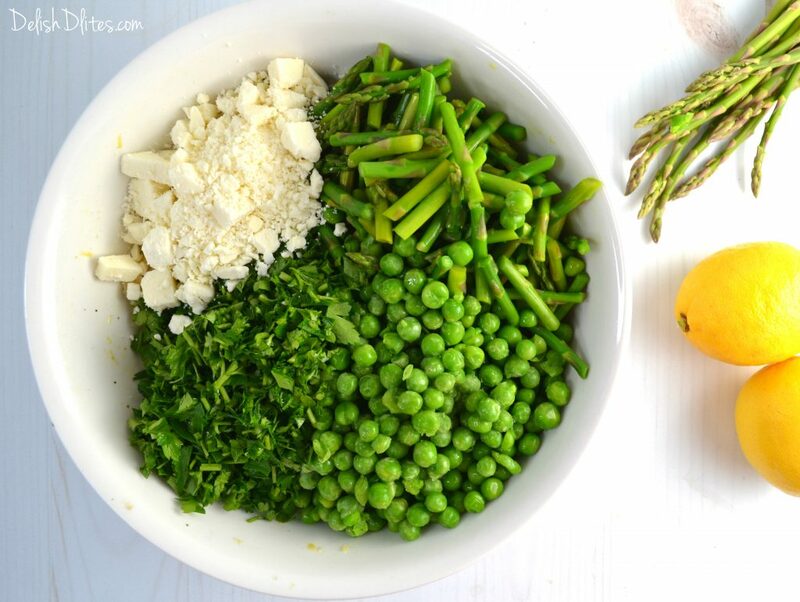 When it comes to food that symbolizes Spring, it doesn’t get better than asparagus and peas. 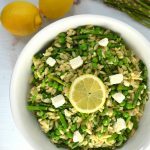 Asparagus and fresh peas are always one of the first Spring veggies to pop up at my local farmer’s market, so I knew I had to make them the star of a Spring orzo salad. Lemons pretty much taste like sunshine, so of course I had to use some fresh lemon zest and juice for the perfect light and fresh dressing. To round of the dish, I add some fresh parsley and crumbled goat cheese to the pasta salad for that verdant, grassy flavor. You can also use crumbled feta cheese…I’ve tried this salad with both types of cheese, with delicious results. This Spring orzo salad is delicious with my grilled lamb recipe, and it’s a perfect side to grilled chicken, fish, pork or even steak. 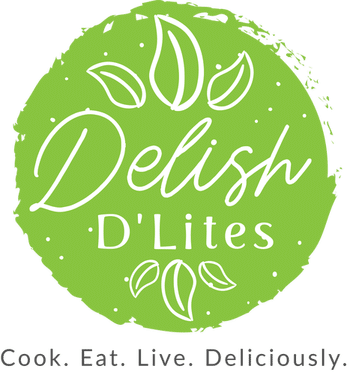 It’s such a versatile dish, and it’s great for an outdoor picnic since it’s only dressed with olive oil and lemon juice. Another bonus, this is a great make ahead dish. Just blanch and shock your veggies, toss the hot orzo with the lemon vinaigrette and refrigerate them separately. 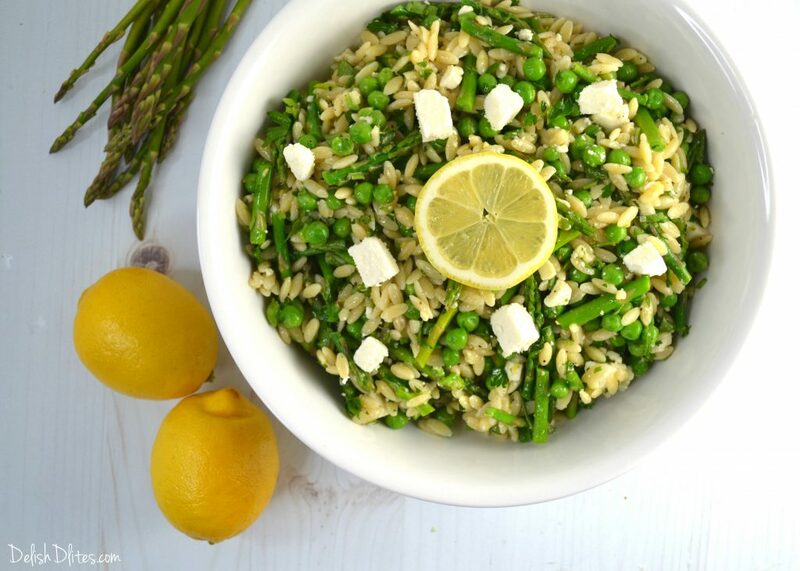 When you’re ready to serve, toss the veggies, parsley and cheese with the lemony orzo. This will keep the dish nice and green. Try this dish next time you want a spring-y spin on your regular ol’ pasta salad. A delicious orzo pasta salad with fresh Spring veggies, lemon vinaigrette and crumbled cheese. Bring 4 cups of water to a boil, then add salt. Blanch the asparagus and peas for 30 seconds in the boiling water, then immediately shock the veggies by dunking them in ice water. Once cooled, drain the blanched veggies from the ice water, and refrigerate them until needed. 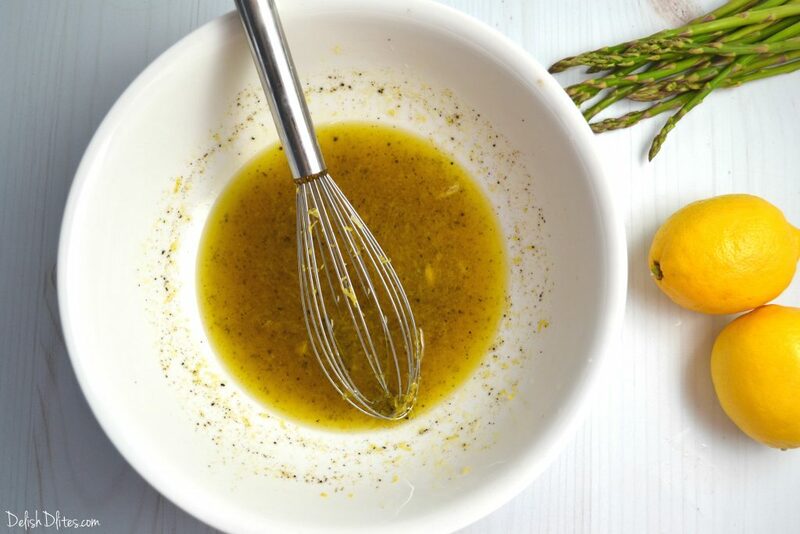 In a glass bowl, add the olive oil, balsamic vinegar, lemon zest, lemon juice, red onion/shallot, and salt and pepper. 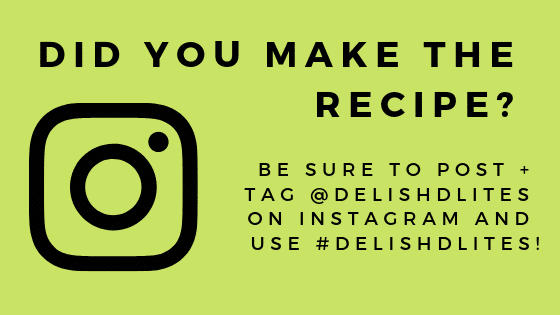 Whisk to combine, then set the bowl aside. Cook the orzo according to the package instructions, then drain and add the hot orzo to the bowl with the lemon vinaigrette. Toss to coat. Cover the orzo with plastic wrap, then refrigerate for 2-3 hours, until cooled completely. 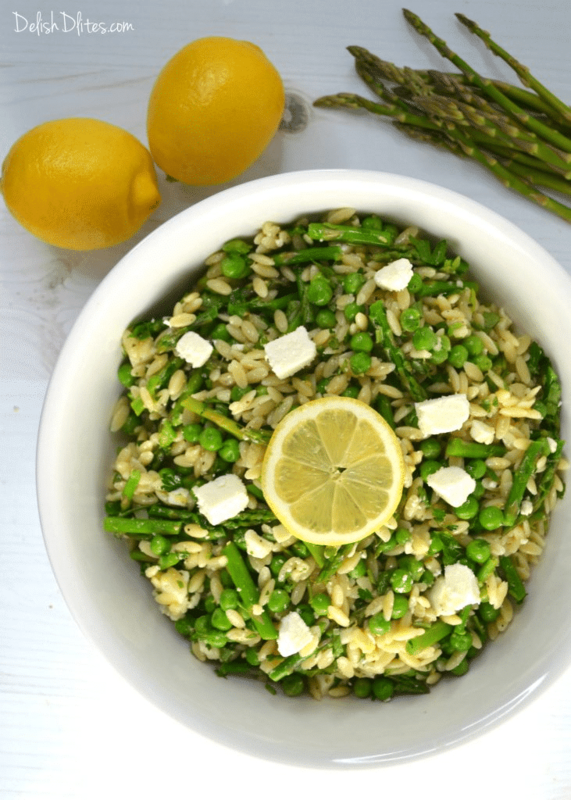 When you're ready to serve the Spring orzo salad: toss the veggies, chopped parsley and crumbled cheese with the orzo. Serve immediately.